Danny Katch reports on a successful student protest last month that forced the NYPD to back off its plans to impose intrusive searches on their school building. 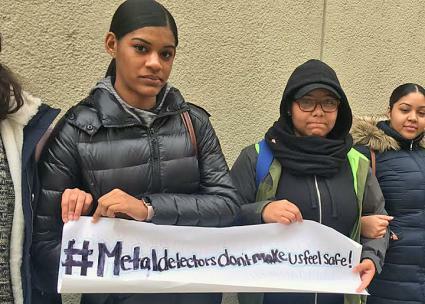 AS MANY as 500 New York City high school students at the Bayard Rustin Educational Complex walked out of their classes on December 8 to protest police harassment via the introduction of metal detectors into their school building. Chanting "Students are not criminals" and "Hey hey, ho ho, metal detectors have got to go," the students held an impressive protest that led to the victory of seeing the metal detectors removed the following week. The massive building, which used to house the High School for the Humanities, now contains six different schools that don't always have a history of getting along. But students, teachers and administrators were quickly united against the sudden introduction of metal detectors at the buildings' entrance, a decision made by the NYPD with no input from--or even advance warning to--school communities. Suddenly, students were being forced to line up in the cold outside the massive school complex every morning, leading to an increase in lateness. Several students received suspensions when officers found butter knives they had brought for home-cooked lunches or pepper spray that some carried in the wake of a recent sexual assault. "There was no sense of warning," says Malala Waseme, a student at the James Baldwin school and one of the protest organizers. "[The metal detectors] just popped up one day." "People felt in a way violated," she added. "They see school as their safe space, and to have police officers scanning you, go through your things, it wasn't taken very lightly. Students stopped coming to school because of the anxiety of being surrounded by metal detectors. Some females felt threatened by rude comments by the police officers." On the first day of scanning, police found a handful of prohibited items among the over 2,000 students--and used that to justify keeping the detectors in place for the next two weeks. Adding to students' frustration was the fact that there are no metal detectors right across the street at the Lab School, where the proportion of white students is higher. TALK OF protesting the scanners seems to have started among students at Baldwin and Humanities Prep, two progressive schools co-located inside the complex, which serve many students who have struggled in other settings. At my school, restorative justice is to have a sit-down meeting with teachers and students to resolve the situation, rather than just punishment. With the metal detectors, as soon as you get to the lobby, they're going through your bag, and they're going to punish you if you do have a "weapon" on you--instead of having a sit-down and finding out why you have this "weapon" or this butter knife. It's definitely contradicting our values. Baldwin teacher McKenzie Angelo agreed, giving the point of view from the other side of the classroom. "Metal detectors undermine our work as educators in many ways," Angelo said, "ranging from the logistics of having to plan for having lower attendance/later class starts to completely reversing the sociopolitical and often emotional work that we do to ensure that our students feel safe and free of judgment when they enter our classes." Waseme says a handful of students decided to start organizing on the second day of scanning--Monday, December 4. That afternoon, she and a few other students went to the Ya-Ya Network, a nearby training center for young activists with strong connections to the Baldwin community. The students came up a strategy of getting to school early each day that week and passing out flyers to build for something bigger. The next step came when a representative from the ACLU was invited to the building to facilitate a meeting with about 50 students from the various schools. At the meeting, students talked about their experiences of police harassment and the feeling that their school had been turned into a prison, as opposed to a safe refuge from the violence of many of their neighborhoods. "What was remarkable about the meeting was bearing witness to students going from feeling like the metal detectors were an inconvenience to an injustice," says Leia Petty, a guidance counselor at Hudson High School, also a part of the complex. "They went from individual frustration and resignation to feeling that this was a collective experience that someone was willing to listen to," Petty said, adding, "It was one of the most moving experiences of my career." At the meeting, students also debated among themselves over how to respond. Various ideas were thrown out, from contacting the media to asking permission from the administration. Some students came into the meeting with a plan to have a sit-in in their hallway, where they would read out statistics on the school-to-prison pipeline. In the end, everyone agreed on a walkout. For Waseme, the meeting was a rare opportunity to connect with activists at other schools in the building: "For me, to be sitting in a room with students throughout the campus was a perfect opportunity to let them know about the protest and figure out a time, as well as collect e-mails." THE NEXT day's protest was a tremendous success--what the students lacked in resources and experience, they made up for in passion. The walkout went to the auditorium, where organizers, faced with a larger-than-expected crowd, struggled without amplification to communicate the reasons for the protest. Eventually, students started marching around the block, chanting, "We are not criminals!" They carried homemade signs with messages like: "We came as students. We left as prisoners," "We do not consent to random searches" and "A little 'Good Morning' goes a long way." When students attempted to end the protest and return to classes, they were told that all 500 would have to go through the metal detectors. After much chanting and negotiation, the students were able to enter without going through scanning. This initial win paved the way for the complete removal of the scanners the following week, a victory that was celebrated throughout the campus. "Our building prides itself on being a welcoming place for students as they walk in," says Petty. "Students are often met with music and warm hellos. This is why when the student protests resulted in the removal of metal detectors, students returned to school and were met with balloons and donuts organized by the staff at each school." "Students were able to organize such a large protest because they are incredible and have the organizing skills to communicate with others and create a plan," said McKenzie Angelo. "A lot of our students are involved in organizing outside of school and are learning about different social movements and issues of oppression and justice inside of their classes. Administrators recognized the significance of how the protest brought unity across their different schools. They have now set up a student advocacy committee that brings together student representatives from each school once a month. I had done more silent protest like wearing political t-shirts, [but] I didn't see myself as someone who spoke out against things...But there was a possibility of the scanners being permanent and I just couldn't let that happen. So I was able to step into a leadership role. Just being out there with so many supporters was being very impactful. It was wonderful seeing the footage and knowing this was something we created. We let the police know we're not standing for this. And [we let] our principals know that we're not going to step back and let this happen.